Romeo is 2 year old male fawn pug. He was rescued from a shelter and as cute as can be! Romeo is doing awesome first and has adapted well to his new life with me. Update from his Furever home: His name was changed by his foster mother. She called him Bear and that is what he answers to now. So we kept the name Bear. I have no questions at this time. Bear is doing well I am a occupational therapy assistant at a skilled nursing facility and he goes to work with me Mon-fri. He does enjoy the pats and hugs. Everyone always asks about him and they love him also!!!!! 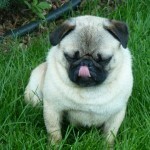 In fact I may need some information for others they want a pug like Bear now!!!! He is very well behaved and follows close behind me everywhere I go. I Thank You all for this amazing dog you have given to me. He is so very important to me already!!! I am very interested in adopting a pug.